Peel the potatoes and cut them into chunks, rinse them under cold wter and put them in a saucepan, covered in cold water. Season with salt (10g of coarse salt/liter), bring to the boil and cook for 10 to 15 minutes. Drain the potatoes and put them back in the pan. Add the horseradish, the olive oil and the milk then smash them with a whisk over a low heat. Pin-bone the sea bass fillets, season with salt and pepper, then spread a few tarragon leaves on the flesh. Roll them, skin out, and hold them together with a wooden pick or silicone string. In a wok, birng a little water with the tarragon stalks to the boil. Put a steamer rack on the bottom of the wok and place the seabass fillets on top. Let them steam over a low heat, with a lid on, for 6 to 7 minutes. Wash the apple and fennel. Finely slice the fennel with a mandoline. Slice the apple unpeeled, then cut it into to matchsticks. Toss everyhting in a bowl with a drizzle of olive oil, a pinch of salt, the lime zest and juice. 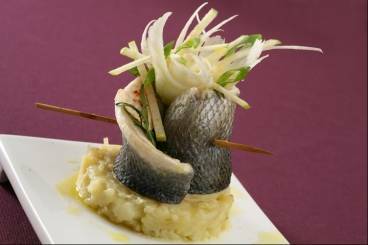 To assemble : put the potato smash in a stainless steel ring on a plate, place the sea bass fillets on top, and decorate with the crispy salad.